АNTARCTIC NATIONS TROPHY – W.A.P. 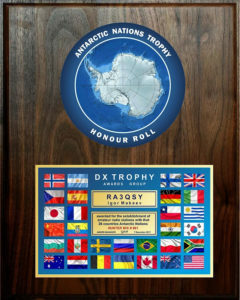 “DX TROPHY AWARDS GROUP” issues a new recognition to Hams ho can prove two-way radio communications with the Countries that have Research Stations in Antarctica; this is called “АNTARCTIC NATIONS TROPHY”. To get it, the applicants need to work Bases of various Countries in Antarctica according to the list shown below. Silver for 10 different Countries, Gold for 15 different Countries ,HONOUR ROLL for 20 different Countries, EXCELLENCE, for working 30 Countries + 1 Multinational. The Awards are issued for different classes or different modes: CW, SSB ,DIGI & MIX. The applicants have to send scan QSL cards or screenshots LOTW/Club Log. There are other 2 specific Antarctic Awards issued by the same Russian Group, they will be pubblished shortly.